click on the photo to download high resolution version. Traveling freely between composed and improvised worlds, Proliferasian is a unique voice rising from the west coast of Canada. The band encompasses both rhythmic intricacy in its compositions and the fluidity and spontaneity in creative improvisation. Distinctive from other Canadian ensembles utilizing Chinese instruments, the unique sound of Proliferasian cannot be mistaken as anyone else. 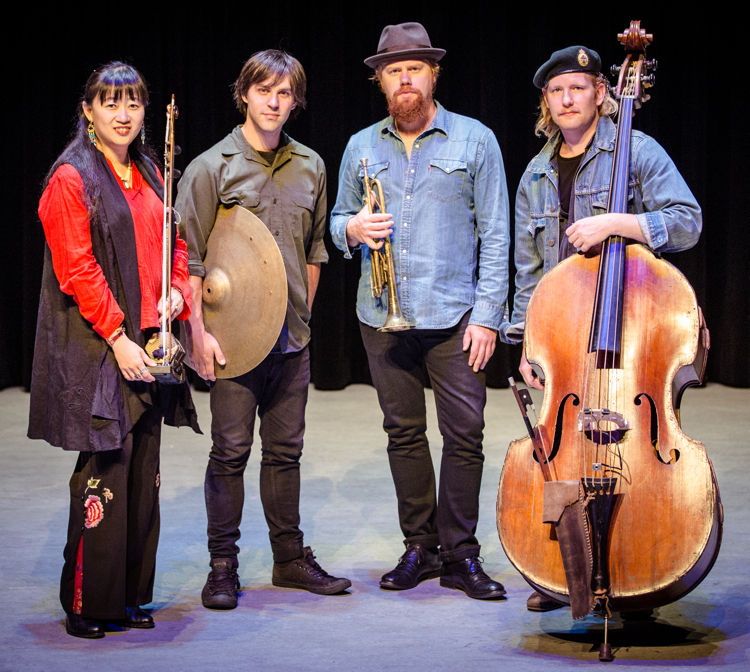 Proliferasian performs cutting edge music rooted in Chinese music and avant-garde jazz, representing the merging of two genres, and embracing even more elements into the equation. The musicians explore the contrasting, complimenting, and sometimes contradicting natures of multiple influences. The result is a new “musical species” that proliferates and transforms continuously. Proliferasian may take inspiration from Asian music, literature, landscape, legends, or paintings, but its music will definitely break any preconceptions of Asian cultures. 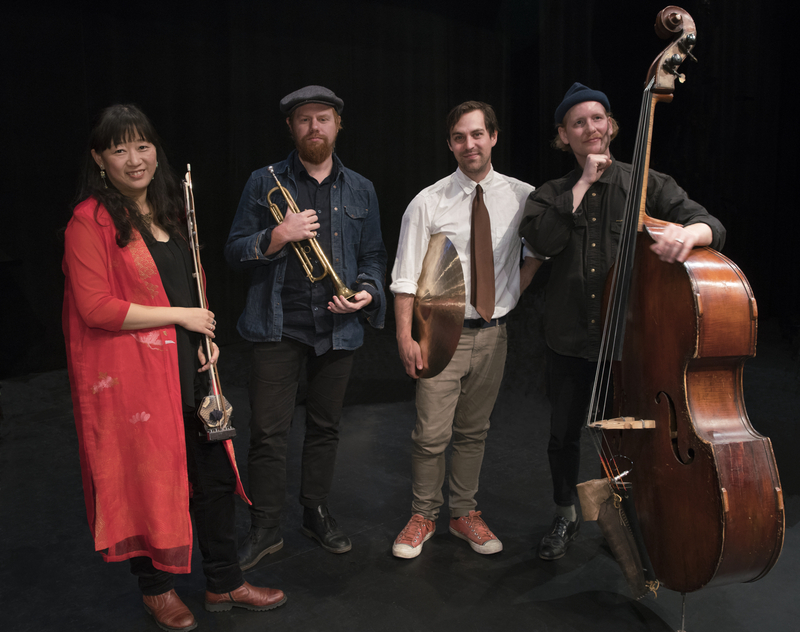 Formed in 2012, Proliferasian consists of some of Vancouver’s most innovative musicians: Lan Tung (erhu/Chinese violin & vocals), JP Carter (trumpet and electronics), Colin Cowan (bass), and Kevin Romain (drums). Proliferasian has performed at the Sonic Boom Festival, Vancouver Jazz Festival, Capilano University Concert Series, the Sound of Dragon Music Festival, and various local venues. The band is named after Vancouver pianist/composer Paul Plimley’s composition Proliferasian, commissioned by the Orchid Ensemble in 2001. This piece was Lan’s first encounter of a composition that has extended structured improvised sections. This band is devoted to the fusion of compositions and improvisation. Therefore, it is quite appropriate to name it after Plimley’s music. Lan creates a new musical language combining her various trainings and influences. The sounds of the East and the West, contemporary and traditional, all enter and exit the canvas freely from time to time. Her rhythmic intricacy has a direct influence from Indian music, while her passionate melodies from Flamenco and Central Asian music, and the sense of breath/space from Chinese music. Lan draws inspiration from ancient myth, philosophy, poetry, paintings, landscape, and other imageries. However, she experiments with contradictions by taking culturally specific materials outside their context and fusing them with other genres. Incorporating improvisation and graphic notations with Asian traditions, she explores a new territory to discover fresh sounds. JP Carter is a multiple Juno award-winning trumpet player and composer from Vancouver, BC, with over 30 years of playing experience. 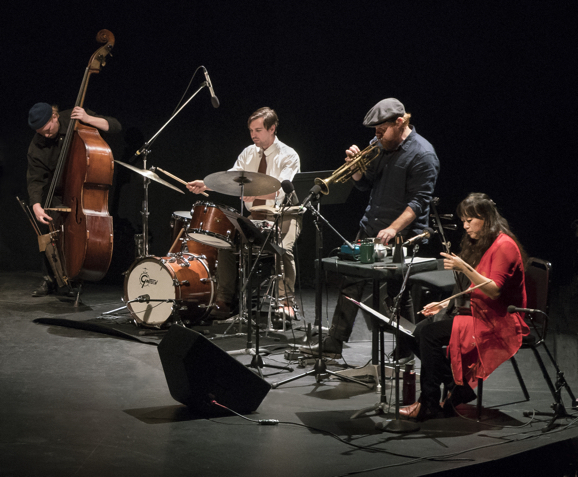 Carter’s singular approach to the trumpet and versatility as an improvisor and composer make him a vital contributor to the Vancouver music community. JP incorporates a variety of techniques into his trumpet playing, utilizing and experimenting with acoustic (traditional, extended) and electronic (effected, amplified) methods to create a wide spectrum of sound. Currently a member of several Vancouver-based groups, including Destroyer, Dan Mangan + Blacksmith, Fond of Tigers, Tony Wilson 6tet, Mary Margaret O’Hara & Peggy Lee’s Beautiful Tool, Gordon Grdina’s Haram, Michael Blake’s Variety Hour, and the various New Orchestra Workshop ensembles. JP’s main projects as a composer/performer continue to be Inhabitants, Aeroplane Trio, and Carsick. These three long-standing original projects have all released albums on Vancouver’s Drip Audio label [dripaudio.com]. Most recently, JP has been working on a solo amplified trumpet project. He will be releasing a self-produced document of this solo work in 2016 entitled “Toy & Tool”. Drummer and composer Kevin Romain has established himself as one of the most in-demand drummers in Vancouver’s creative music scene. After relocating from Windsor, ON in 2007, Romain studied jazz and contemporary music at Vancouver Community College. Since then he has toured regularly across North America as well as Europe and West Africa. He has studied with Mark Guiliana, Tomas Fujiwara, Bernie Arai and Dylan Van Der Schyff, and has shared the stage with notable musicians such as new music luminary Anthony Braxton and the late legendary West African percussionist Doudou N’Diaye Rose. In the past year alone, Romain has travelled to Dakar, Senegal to study Sabar music and perform in the Deggi Daaj Festival of Drumsets and Dance, completed a solo residency at the prestigious Banff Center in Alberta, received a professional development grant from the BC Arts Council to study in New York City for six months, and played two full scale tours in the USA. Romain is now based in East Vancouver and maintains a presence in Brooklyn’s creative music scene. He can be heard performing regularly with art pop ensemble Only A Visitor, new music iconoclasts We Just Stole A Car, and indie rock group Mega Bog among many others, and also leads two jazz trios under his own name. Romain has garnered acclaim as a unique voice in the free improvisation community and is currently writing an instructional book detailing his polyrhythmic concept entitled Natural Time Through Precision.